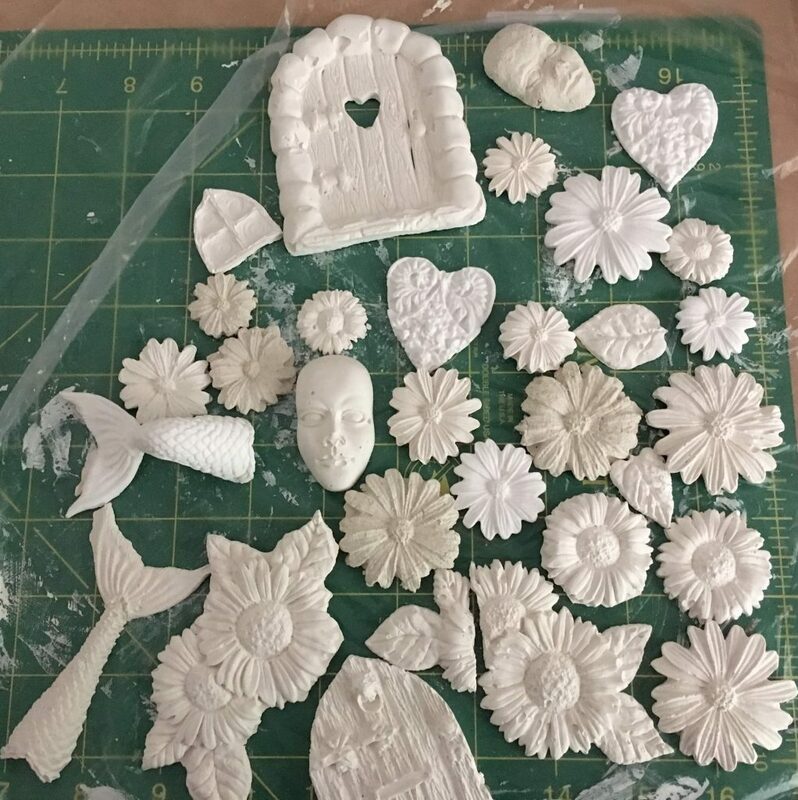 The above castings have been made using Fimo – the bright white; StoneArt clay – the grainy more creamy/ grey colour and plaster of paris – the rest. I liked working with the Fimo the best, sadly it is the most expensive, it is easier to shape once the piece has been removed from the mould, for example the mermaid/fish tail, I was able to create an arch before it was baked in the oven for 30 minutes. The plaster of paris, the cheapest product, was the most difficult and messy to work with, once hardened the easiest to break (see above flower group), the StoneArt fits inbetween the other two products, once mixed it has a longer working time than the plaster of paris as it is slower to harden – I followed the mix instructions on the container although I will be working further with the mix to see how far I can push it. I have yet to try the air dry clay, that is for another day. Fimo – easiest to work with, to shape but requires baking in an oven, expensive. Plaster of Paris – cheapest, quickest to set, brittle, difficult to shape other than in the moulds, messy. SoneArt clay – fits in the middle, needs more experimentation by me. All the pieces are destined to be used in my mixed media pieces.